Acting President Constantino Chiwenga on Wednesday banned protests at all public health institutions, immediately drawing the ire of rights groups. Chiwenga, in a statement that seemed to have been aimed at whipping up public emotions against striking junior doctors said government will no longer allow picketing at its hospitals. The medical practitioners have been on strike demanding better working conditions since the start of December. "... government will not allow any demonstrations at medical facilities whose purpose is to treat patients and ensure their full recovery," said Chiwenga. However, Zimbabwe Human Rights NGO Forum director Blessing Gorejena said the government was in violation, not only of the Constitution, but international labour conventions. "Section 59 of the Constitution gives people right to demonstrate and the move by government is not only illegal but a violation of the national governance charter," said Gurajena. "It is undemocratic and retrogressive. The ban flies in the face of numerous international labour conventions of which Zimbabwe is a State party. "It is a violation of the doctors rights and given that it is a blanket ban it will affect other health professionals as well as other general workers at health institutions." 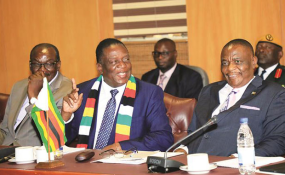 Zimbabwe Congress of Trade Unions president Peter Mutasa said the move exposes President Emmerson Mnangagwa's administration after it sought to project itself as reformist and different from former President Robert Mugabe. "We are worried but not surprised," said Mutasa. "These government actors have been attempting to project themselves as reformers but now under pressure are showing who really was behind Mugabe's dictatorship. "This level of paranoia and heavy-handedness shows that the Government is clueless and has no solutions for the myriad of problems haunting the country." The ZCTU leader warned that a "command policy" will be unsustainable, adding that the order by Chiwenga will be resisted. "We cannot have the whole country driven by orders and unlawful orders for that matter," he said. "That order has no legal basis for the Labour Act allows workers to picket outside their workplaces. Again, the order is also clearly unconstitutional. "Workers and citizens are facing serious hardships and the government must provide solutions not threats. Workers will naturally disobey such unlawful orders and continue with protests aimed at forcing economic reforms. "We urge the presidency to sober up and accept that the country is in a serious crisis and needs collective effort through dialogue." In April last year Chiwenga, after being given mandate to resolve the impasse between government and nurses, fired over 16,000 of then before Mnangagwa reversed the decision. Two weeks ago, the vice president fired over 500 striking junior doctors a move that has forced Mnangagwa to cut short his annual leave.